Change management is a broad subject and can be applied to all different types of organizational change. The most common change drivers include: technological evolution, process reviews, crisis, and consumer habit changes; pressure from new business entrants, acquisitions, mergers, and organizational restructuring. They all have one characteristic in common—they affect people and their paradigms. They change the status quo (the way things are done) and take people out of their comfort zone. We believe that, before the changes are consolidated in the organization, they need to touch the human being. That is why we call our body of knowledge the Human Change Management Body of Knowledge. We believe that it is through human change that we achieve organizational change. Managing change means humanizing it. It means to design the project from the standpoint of the people involved in order to avoid the fact that natural resistance has an impact on planned objectives. 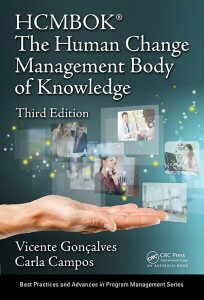 The HCMBOK® – Human Change Management Body of Knowledge is the knowledge base of HUCMI. Comprising methodology, tools and good practices, its objective is to link the Organizational Change Management activities to the phases and typical management activities of projects of any nature. Its structure comprises 48 macro-activities and 203 activities, developed from the planning up to the post-project phase, also known as “production,” when the project itself is already completed but the change must be supported until it is embedded into the organizational culture. 1.1. Is changing so hard? 1.2. What has changed in the change processes?